When They are Not Dancing, They are Eating! There are really two different types of diet for the house mouse; one wild type diet and another very different diet for those inhabiting a house. 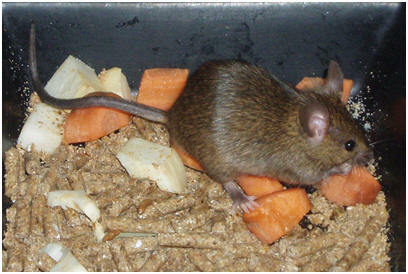 For the wild mice, their diet usually consists of many different seed types, corn, wheat, fruits, and even insect larvae. For the house mice that actually live in a house, they will eat anything available to them including breads, grain, cereal, candy, meats, and whatever else they have access to. Mus musculus is considered an omnivore because it eats both autotrophs, like corn and weed seeds, and animals, like insect larvae and other available meats. Because of this, it falls in the food web as a secondary consumer. The primary producer would be plants like corn, and the primary consumers would be the insects that eat the plants. The house mouse does not have to do a lot of work to find its food for the most part. It generally feeds on corn and grains left over on the ground after crops are harvested and does not really need to hunt down it's food by any means. They also have quite a low water requirement as well. Once they have eaten their food, it takes much the same path as it would for you and I. The food is digested by the digestive organs and transported throughout the body by the circulatory system. When their is an excess of food, it is stored as glycogen in their cells or is stored before eating in a safe place to be eaten at a later time. Although the house mouse generally stays covered by grasses and brush, and is also very quick if it has been spotted. Serves as an important food source for many animals. 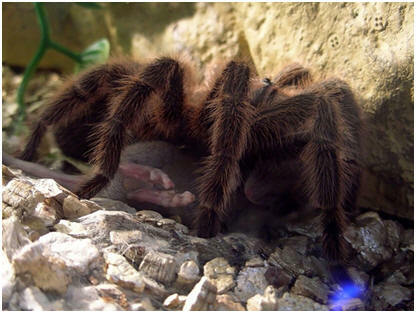 Predators of the house mouse include cats, foxes, owls, and other larger birds, snakes, lizards, and even spiders!